Heritage is offering what they say is the "Last Out Ball" from the 1917 World Series. Heritage Auction Galleries in Dallas made news recently when Haulsofshame.com tipped off Deadspin that they were selling off Curt Schilling’s famous “Bloody Sock” at their February auction in New York City. It’s not “that” bloody sock from the 2004 ALCS against the Yankees, Schilling threw that one away. Heritage’s offering is said to be Schilling’s bloody sock from the 2004 World Series against the Cardinals. Schilling says its that sock, but back when he loaned it to the Baseball Hall of Fame broadcaster Gary Thorne made waves when he alleged the sock was a fake. Hall President Jeff Idelson then came to Schilling’s defense and vouched for the bloody sock, stating that Schilling offered the sock to him in the locker room in St. Louis right after the Sox broke the long standing curse that had stood since 1918. Heritage has another impressive relic from a Fall Classic that was played one year before that old Red Sox curse commenced back in 1918 and it comes with an affidavit from the son of Hall of Famer and White Sox pitcher Urban “Red” Faber, saying its the real deal. Urban Faber Jr. penned the inscription on the ball many years after it was tossed around on the Polo Grounds of John J. McGraw attesting to its import as the “Final Out Ball” from the 1917 World Series. Down to his last out in the bottom of the ninth, legendary manager John McGraw sent back-up catcher Lew McCarty to the plate in place of pitcher Pol Perritt. With a man on second, McCarty represented the tying run, but Faber coaxed him into a slow grounder to second, where Hall of Famer Eddie Collins scooped up this baseball and flipped it to future Black Sox conspirator Chick Gandil to end the battle. 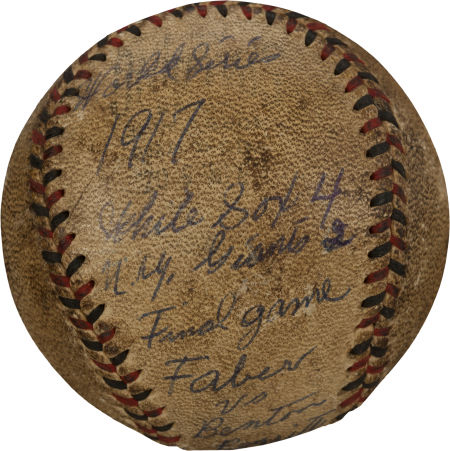 Eighty-eight years after Shoeless Joe and the gang celebrated in front of a dejected Polo Grounds crowd, this baseball entered the collecting hobby in a 2005 auction, consigned by Urban Faber, Jr., the son of the man who saved his last pitch ball for posterity. The elder Faber’s notation on the side panel of the Official National League (Tener) ball reports, “World Series 1917, White Sox 4, N.Y. Giants 2, Final game, Faber vs. Benton/Perritt.” It should be noted that the writing dates to decades after the game, applied after the original notation had faded beyond legibility. The ball exhibits expected wear and age-toning, but the notation projects flawlessly. A signed affidavit from Urban Faber, Jr. attesting to the authenticity of the baseball is included, as is a signed 8×10″ of his father. Letter of provenance from Urban Faber, Jr. It all sounds amazing and Hall of Fame worthy. A relic evoking the Black Sox before they went bad. Back when “Shoeless Joe” and the boys were winners, not fixers (allegedly). Like Schilling’s bloody sock it comes with a good story and an alleged provenance from the family of a Baseball Hall of Famer. But just because a player or his family swears a ball or another piece of equipment was from a famous play or game, doesn’t necessarily mean it is authentic. That being said, why is the last out ball of the 1917 Fall Classic signed on a “Cushioned Cork Center” Official National League Ball manufactured in 1926, almost a decade after Game 6 of the 1917 Series? The alleged Last Out Ball from the World Series of 1917 (left) has the stamping of a "Cushioned Cork Center" ball first manufactured by Spalding in 1925 (right). The ball is soiled but the Spalding stamps don’t lie. It reads: “Official National League” with “Cushioned Cork Center” underneath. 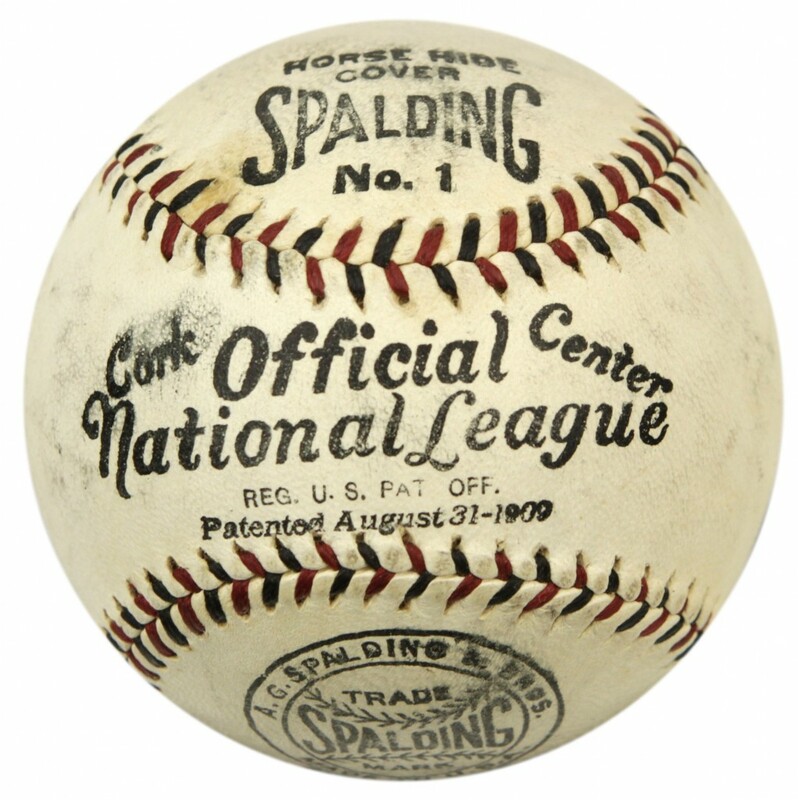 Spalding’s “Cushioned Cork Center” was identified as such on a baseball for the first time in the Spring of 1926. What’s more, genuine NL balls from 1917 had 112 red and black alternating stitches while the Heritage ball appears to have only 106 stitches. The alleged 1917 WS ball clearly bears the stamping of a "Cushioned Cork Center" baseball that wasn't patented by Spalding until 1925. 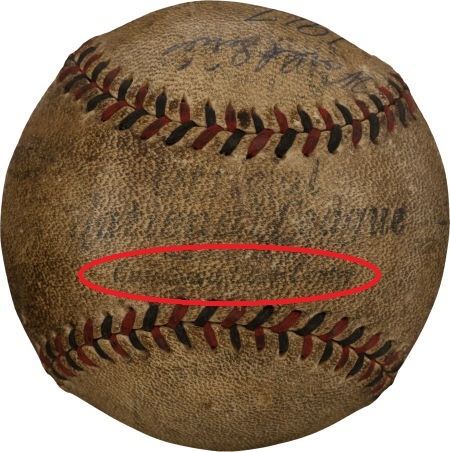 An authentic National League ball from 1917 has the words “Cork” and “Center” placed diagonally as book ends to the word “Official” stamped on the sweet spot of the black and red stitched baseball. The ball does not have any reference to a “Cushioned Cork Center” and identifies a 1909 patent. In contrast to the alleged 1917 ball offered by Heritage, this authentic c.1917 NL ball displays the proper stamping denoting the ball's "Cork Center" diagonally to the left and right of the "Official" stamp. Heritage was scheduled to auction the ball at its live Platinum Night event in New York City on February 23rd. Heritage doesn't mention they sold this ball last May as possibly being the last out ball from the 1917 World Series. 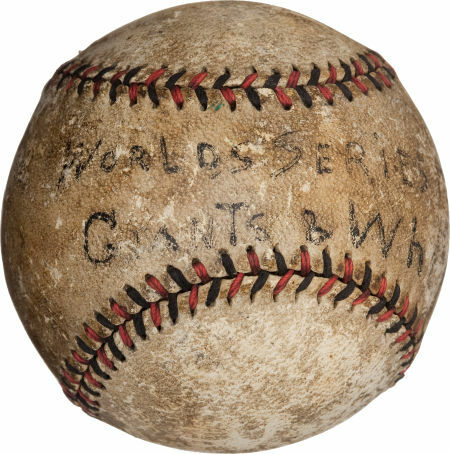 1917 World Series Game Used Baseball–The Final Out? Ancient sphere was discovered at an estate auction near York, Pennsylvania, not far from the town of Reading where New York Giants player Lew McCarty lived and died. This fact becomes particularly intriguing when we consider that his name is penned on the opposing sweet spot from the bolder vintage application of the words “World’s Series Giants & White Sox.” Unfortunately the name is all we are able to make out on this area of the ball, but it’s clearly a period notation, which leads us to consider McCarty’s role in that early Fall Classic. Intriguingly, we find that, with two out in the bottom of ninth inning of the sixth and final game, McCarty was tapped to pinch hit for Giants pitcher Pol Perritt, grounding out to second to end the Series and establish “Shoeless Joe” Jackson’s White Sox as World Champions. While we cannot definitively establish this as the last ball of that Series, the tradition of saving Championship-clinching balls was already well established at this juncture of baseball history, and this manner of notation is consistent with known examples from other years. Certainly it is at the very least a game used ball from that famous World Series, and the final out would seem to be the only incident from that October that would merit a mention of McCarty. Given the fact that the ball was discovered in McCarty’s backyard, the suggestion that he might have picked it up after the out was recorded is also a reasonable speculation. The ball exhibits heavy wear, clearly dating to both before and after the ancient notations, and while the ball’s stamping has been lost to the ages, the black and red stitching is correct for period ONL horsehide. A thrilling relic from the White Sox last Championship of the twentieth century. What research could Heritage do beyond reading this. Thats funny. All I can say is,Halper is coaching them from down under,cause we know he isnt upstairs !!!!!!!!!!! i think busting heritage auctions for all the fakes they sell is a full time job, someone in texas needs to keep a copy of all their catalogs, so they can check exactly how many ‘Last Out Balls from the World Series of 1917′ they have sold already! the ‘experts’ at heritage appear to be nothing more than scammers and sales people who write good copy so they can make more sales. as i said before, heritage knows the scammer who created this fake ball, and CONTINUES to do business with him, auctioning off fake item after fake item FROM THE SAME PERSON, over and over again! i hope the feds raid heritage and seize their records, if they do, they will have a complete list of all the scammers in the country!! mastro auctions used to be the top sports auction house, i warned people for years that they were scammers… NOW THERE IS NO DOUBT! people are leaving the hobby because of the scammers, it has NOTHING to do with the economy, scammers and counterfeiters are turning people in this hobby into victims… how much longer are you people going to stand by and watch it happen??? at least this website, haulsofshame.com is trying to do something, kudos to them… what are you doing? This stuff would make for a GREAT reality show on History Channel. Get Brandon Grunbaum along with some REAL forensic handwriting experts, ink experts, etc. Also maybe a “master forger” or two, like ex-con types. Now bloody socks? Yuk… Curt Schilling did what he should have done with it! Come on collectors…really? Where are the boundaries? There was no “curse of the Bambino.” That was fiction made up in recent times.